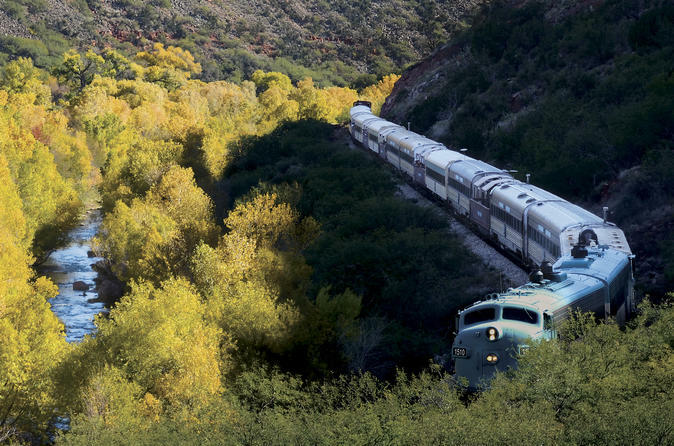 Take a trip to the Verde Valley. Experience the history of the "Wickedest Town in the West" in the ghost town of Jerome. Next, take a tour of the Copper Art Museum in Clarkdale and learn about the second oldest known metal in the world. Finally, sit back and relax in your first class seat aboard the Verde Canyon Railroad, while soaking in the serene surroundings. The day will begin with a pick up from most hotels in the Phoenix/Scottsdale area between 6:30-7:30 AM. After hotel pick up, we will tour to the heart of the Verde Valley, learning the history, culture, and geology of Arizona. Our first major tour stop will be the historic mining town of Jerome. During our time in this historic mining ghost town, we will explore the history that made it “the wickedest town in the West.” Following our stop in Jerome, we will then visit the Arizona Copper Art Museum in Clarkdale. While at the museum, learn about the second oldest known metal in the world and all the practical uses for it. After our time at the museum, we make our way to the Verde Canyon railroad, where your first class seat and hor d'oeuvres await you. Take in the beauty of your surroundings, as the train makes it's four hour journey through the valley. At the conclusion of the trip, your guide will be awaiting you at the station to take you back down to Phoenix.